Today when I look behind I remember those beautiful child-hood days and my mind suddenly flickers down the memory lane and slowly takes me some where around the year period 1965-1966. Those were the first impressions of my child-hood days where I tried to understand & know a little of myself & the small world around me. The first film which I clearly remember in that period which I sat & saw was “Ram aur Shyam” and the beautiful song “Aaj kee raat mere dil kee salami le le” with the greatest Dilip Kumar on the piano and the greatest Mohammed Rafi singing for him. What an immaculate impression that was which helped create in me the greatest ever combination of Yusuf – Rafi – Naushad & Shakeel. Today these 4 personalities have become a part of my entire stream never to erase and never to wash out. Though I am very much fond of writing to have initially started by virtue of publishing my various letters & comments in a couple of the newspapers and presently having regular correspondence with my existing employment I for one still finds it extremely difficult to pen down my thoughts and expressions in the everlasting and loving memory of Mohammed Rafi Saab. This probably happens mainly on account of ones deep love and respect for the personality on whom he OR she writes, and this experience I have always experienced. Today I would try and make an effort to search for the songs sung by Rafi Saab for Dilip Kumar under the music supervision of other music directors. The second category is where other MDs have scored the music for Dilip Kumar films and Rafi Saab has rendered the songs. This entry was posted on Sunday, April 19th, 2009 at 10:54 am	and is filed under Meri Awaaz Suno. You can follow any responses to this entry through the RSS 2.0 feed. You can leave a response, or trackback from your own site. There might have been some misunderstanding for a very short time between great Md Rafi sahab and Dilipkumar, which resulted in his absence as a singer in the said film, as you mentioned . But having had a lean patch in preceding few years ( not more than 2/3 I presume), he probably didn’t have any rationale to opt himself out to sing for a thespian of acting like Dilipkumar, whose combination with him had taken the country by storm since Jugnu in the 1940s! So, there might be some other underlying reason working underneath. Since that was a time when, RD Burman and company were not favouring Md Rafi and were rock solid in their decision never to make any room for the greatest singer to stage a come back, RD himself could be instrumental behind abandoning him as a singer in favour of Kishorekumar. Because, due to his age, Burman dada’s recording scenario was totally dependent upon his son to say the least. And secondly, let’s remember, when Dada Burman suddenly fell seriously ill, despite Md Rafi was contracted to render all songs of Araadhana to be recorded on Rajesh Khanna, it RD Burman who brought it Kishorekumar and got him to sing three of the five male songs for the hero. Otherwise, how would you explain the fact that Md Rafi who had become the most favourite singer of SD Burman since 1957 ( Ptassa) to could be totally abandoned from Dada Burman ‘s music room from 1971 to almost 1975! ( of course, Gambler ( 1973 ) Abheeman (1973) and Anurag (1973 ) were exceptions) Actually, those slow paced brilliant combination of Abheeman, were tailor made to be sung in the mesmerising of voice of none other than Md Rafi! When Rafi sahab sings for any character,whether it is Johny Walker or david(Nanhe munne bachhe teri Muthi ) or no hero material like Deepakkumar (Aabroo),anybody feels it is the character who is singing,such was the verstality some one said in above article, One Sun,One Moon and ONLY RAFI. AS SAID IN ONE OF ABOVE MSG THAT IF FILM FARE AWARDS STARTED EARLIER THEN DILIP SAAB AND RAFI SAAB WOULD HAVE WON MORE AWARDS THAT BREAKING THEIR RECORD WOULD BE VERY DIFFICULT. Mukesh was very suitable for raj kapoor,.Kishore was very suitable for devsaab,rajesh kaka but m.rafi was suitable for all actors from dilip kumar to rishi kapoor specially for shammi kapoor,dilip kumr,rajendra kumar,jitnder,joy mukerji,biswajeet shshi kapoor rishi kapoor,and lot of others.More over he was a all rounder and sung all kinds of songs which was not possible by others.almost all good bhajan and desh bhakti songs are by rafi saab only. With regards to filmfare awards, Rafi and Dilip saheb could have won many many more awards had it started earlier when these two were in thier prime. I just read the article, the posts and feel a bond with all Rafi, Naushad, Dilip and Shakeel lovers. I am also from that ‘Ram aur Shyam’ era and feel heavily nostalgic about the glorious, romantic, musical and magical quality of those times in the 60’s and early 70’s. They can never ever be replaced. But at least, there is a whole band of people all over the world who understand this magic, the combination of these four stalwarts who made this magic without even having to really try hard. It just seemed to be a gift from God. And the proof of that is in the fact that this music and the memories associated with them (not just on screen, i.e. Dilip and those beautiful heroines like Madhubala, Vyjayanti, Waheeda, Meena Kumari, Nargis but also off screen in our own lives with our own innocent romantic dreams at that time) are all so immortal. thanks for great write-up, great combinations. both rafi saheb & dilip saheb were king in their field of Hindi Cinema. In earlier films of Dilip Kumar singers like Mukesh and Talat Mehmood were the voice of Dilip Kumar. Naushad saheb fixed voice of Rafi Saheb to playback for Dilip Kumar first time in Deedar (1951). From then Rafi Saheb was the voice of Dilip Kumar in almost his films : Aan(1952), Amar (1954), Uran Khatola (1955), Kohinoor (1960),Mughal-E-Azam(1960), Gunga Jamuna(1961), Leader(1964), Dil Diya Dard Liya (1966), Ram Aur Shyam (1967), Sungharsh(1968), Aadmi(1968)Gopi (1970), Daastan (1972), Bairaag (1976) and Kranti (1981). Out of which Ram Aur Shyam is a landmark film which was re-maked in severl times in male or female version later stag. After a number of box office flops in mid 1960s, Dilip Kumar comeback in double role with full of comedy, action, dance and all nitty-gritty in Ram Aur Shyam (1967) that was a biggest box office hit. But Naushadâ€™s compositions with Rafi songs overruled all nitty-gritty of the film. The remarkable songs were â€œAaj Ki Raat Mere Dil Ki Salami Le Leâ€, â€œAayee Hai Baharen Mite Zulm-Sitam Pyar Ka Zamana Aaya Door Huye Gaamâ€ by Rafi, â€œMain Hoon Saqi Tu Hai Sharabi Sharabiâ€ by Rafi-Lata was picturised on Dilip Kumar and Waheeda Rehman and â€œLut Liya Dil Tune Mera Raah Mein Chalte Chalteâ€ by Rafi-Asha was picturised on Dilip Kumar and Mumtaz. In late 1950s, Rafiâ€™s voice, Naushadâ€™s music and Shakeel Badayuniâ€™s lyrics would become super-duper hit and the songs were being heard in all corners of the streets. The combination is famous for extraordinary songs picturised on Dilip Kumar, the greatest actor whose performances are renowned as the epitome of Indian Cinema. thanking you once again for your childhood nostalzia. Great combination of Rafi+Yousaf+Naushad+Shakeel and you highlight it very beautifully. Rafi Sb gave his beautiful voice to the words of Shakeel Sb with Naushad classical compositions and Dilip Sb gave his expressions to make it eternal. Whenever we talk about Dilip Kumar we will definitely talk about Rafi Sb’s great renders to him. IT’S AN EXCELLENT ARTICLE BY YOU ! I WOULD SAY : ALL SONGS RENDERED BY RAFI SAHAB (THE ‘BADSHAH’ OF ALL PLAYBACK SINGERS ) FOR DILIP SAHAB ( THE ‘BADSHAH’ OF ALL ACTORS ) ARE ” KOHINOOR ” SONGS !! Mohd Rafi was like a great player in any team he was the team was the winner..
Hi everybody.Thx from the bottom of my heart for displaying the memories of the golden era of indian music.I was born only in 1965.so i missed the terrific days of Rafi sahab.however,I still treasure songs like parda hai parda hai,Darde-dil darde-jigar etc..may God bless Rafi sahab & all his fans. Very nice article for the legends Rafi Sahab and Dilip Kumar. Also very rightly highlighting the fantastic four: Shakil, Naushad, Rafi and Yousuf. Yes! Devdas had a bautiful Rafi number “Rahi o rahi”; but I am not sure whether it was pictruised on Dilip kumar or it was a background song. Thanks for reminding everyone about the brilliant combination of Dilip Kumar and Rafisahab. In fact I had written about Naushad’s combination with Rafi in station hollywood I mentioned about the two giants and as Dilip Kumar enjoyed the combination with Rafi and Naushad the most I mentioned about Dilip Kumar as well. What mattered more to me than the no. of songs was the standard of them having rich lyrics of Shakeel Badayani, excellent lips of Dilip Kumar and classical touch of Rafi. The songs of Dil Diya Dard Liya like “koi sagar dil ko behlata nahi”, “dilruba maine tere”, “guzrehe aaj ishq ki”, etc., the ones of Leader like “ek shahehshah ne banwake hasin tajmahal” or “tere husn ki kya taarif karoon”, or “madhuban me radhika nache re”, or “do sitaron ka zameen par hai milan” in Kohinoor, or brilliant having pure classical base, ghazal andaz, folk everything embedded in them. I totally disagree with the 99% combination of Shankar Jaikishan with Raj Kapoor and Mukesh. Raj Kapoor sang numerous number of songs of Manna Dey composed by SJ like “mur mur ke na dekh”, “pyar hua ikraar hua”, “dil ka haal sune dilwala” in Shree 420, “yeh raat bheegi bheegi”, “aa ja sanam” in Chori chori, etc. Rafi sang in almost all the films produced or directed by RK till Jaikishan was alive in 1971. Rafi’s songs included “hoshiar hoshiar” in Awara, “nanne munne bacche tere mutthi me kya hai” in Boot Polish, “ramaiya vasta maiya” in Shree 420, “yeh mera prem patra par kar” in Sangam, to mention a few. Dilip Kumar was a giant actor and acted in the composition of many composers including Salil Choudhury in Madhumati and Musafir. Khayyam in Footpath, KA in Gopi, Bairaag, Tapan Sahina in Sagina Mahato, etc., but wherever Rafi had sung for Dilip Kumar the songs became super hit, irrespective of whether composed by Naushad or Salil choudhury or KA or LP, etc. Perhaps Rafi had brought the tragic andaz of Dilip Kumar better than anyone else. Dear Bijoorbhai, Adaab Rafi ! A great article with ur childhood memories freshened up and it has enlived my childhood also. Distinctly remember the song situations of Ram aur Shyam seen in 60s. Keep it up and please continue to regale us with all datas..
Congrats, Bijoorji. Keep up the good show. Rafisahab-Dilip Kumar is indeed a deadly combo. As Murthy sir has rightly pointed out, Rafisahab did introduce that subtle softish throaty voice modulation for Dilip saab and indeed it fitted Dilip saab’s speaking voice and persona like a glove. It is too sad the these two great artists had a bit of misunderstanding in the ’70s, after that wonderful partnership of about 25 years. old timers in the industry say that mohd rafi saaheb decided that he will no more sing for dilip kumar – after a music event down south where rafi was sidelined by dilip saaheb. naushad saaheb also was part of the team. thus there were no songs of rafi ji in sagina mahato and in came kishore kumar thanks to s d burman. a section of the music lobby ( pro kishore, pro burmans ) announced from loudspeakers that rafi days are over and the press made headlines over the news. some copies did sell . later on a patch up happened it seems. Bijoorji, superb article. You have told us everything we want to know about Dilip Kumar. Rafi-Dilip combination is undoubtedly the best. Who can forget Dil diya dard liya or Ganga Jamuna or Sunghursh or Leader songs? 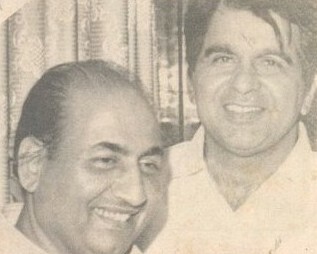 Though Talat had sung for Dilip, it is Rafi’s voice which suited him perfectly. I don’t know why SD Burman chose Kishore Kumar in Sagina. Kishore is a good singer but his voice did not match Dilip. it is really loss for fans of dilip kumar and sj that they did not work on many projects otherwise we could have seen how sj would have made their Dilip kumar style of music like they did it for rk, shammi, rajendra kumar and even for dev anand. it is truly strange that dilip kumar and sj did not get chance to come together for more films. there may be reasons for sj’s style of choosing singer to suit their composition more than that of choosing favourite singer of particular artiste. especially shankerji had many times refused to bow down before actors if they have asked for certain singer for certain songs and did what he thought was best for his composition. once he showed the then jubilee star rajendra kumar his way when he did not like manna dey to sing ‘muskura laadle muskura’. Though there is no such incident for dilip kumar but it is said that dilip sahab was also not in favour of mukesh for ‘yeh mera deewanapan hai’ for yahudi. may be (not sure) that dilip sahab might have agreed to that at that time and would have taken this as a refusal to his status. but it is totally my speculation on less dilip+sj combo. My lovely singer Rafi Sahab is the singer of a lot of centuries. His voice is special gifted from GOD. we lover loves Rafi Sahab ever. I m very impressed to hear Rafi Sahab songs. small but nice article from you. as i was going though your article i remembered my childhood. its all the decission of the music director to select the playback singer who suits to the situation. people say rafi sahab was not taken by salil choudhru sahab. but in the dilip starrer ‘ madhumati ‘ rafi sahab has rendered ‘ jangal mein mor nacha kiseenena dekha’ as a playback for johny walker. in yahudi another dilip starrer rafi sahab had rendered ‘ tootey hue khwabo ne ‘. it was the thought process of the music directors that for that situation its only rafi sahab who can do full justice to the composition with correct feel of emotions. if you analyse the song ‘ jangal mein mor nacha’ the base level of the voice at the mukhda & in the song ‘ tootey hue khwabo ney ‘ the treble level of the voice at the antara i am sure except rafi sahab no other singer can reach that level. similarly in the song ‘ ramayya vastavayya’ the entry of rafi sahab with high treble in antara are truely remarkable. therefore let us not bother whether rafi sahab was considered or not. he has his own place, position, importance. he never craved for any position or success. it all came to him of its own. the slot of rafi sahab is constant. it was there, it is there & it will be there for he is the most sought after & irreplaceable ‘ play back singer ‘ . that’s why due to his physical absence well feel the ‘ void ‘ for ever. Few additions. Naya Daur had many songs by Rafi on DK apart from Mang Ke Saath, Sathi Haath Badana, Dil Leke Daga, Ye Desh Hai Veer Jawanon Ka, Ude Jab Jab Zulfe Teri, etc. apart from AAna Hai To AA in back-ground and Mai Bambai Ka Babu on Jhonny Walker. Dastaan songs on DK were sung by Mahendra and the only song of Rafi came in the back-ground ‘Na Tu Zamin Ke Liye’. LP also used Rafi in Kraanti on DK in the song “Chana Zor Garam”. Yes, Sagina had KK as DK’s singer but if I remember properly, Devdas had Rafi numbers. But as you rightly pointed out, the combo of Dilip, Rafi, Shakeel and Naushad was a great team which gave us memorable songs. Naushad infact used Talat in the beginning and Mukesh in Andaz, but later completly shifted to Rafi for Dilip. C Ramachandra used Rafi in Insaaniyat also starring Dilip and Dev. Bijoor ji has written about four of our “brighest jewels” from the hfm. Its a treat to read about many of our stalwarts from rafi lovers who are now surfacing – in large numbers. Naushad saaheb, born dec.25th, and rafi saaheb born dec.24th and dilip saaheb on 11th dec. have timeless works to their credit. long live music and the foursome : rafi, dilip, naushad and shakee. Nice little article from Mr D P Bijoor bringing forth his childhood memories in respect of the 2 of the Greatest personalities in the form of Mohammed Rafi & Dilip Kumar (Yusuf Khan). Both these greats were born in the month of December, Dilip Saab on 11/12/1922 & Rafi Saab on 24/12/1924 and both were indeed the residents of Bandra (West) Mumbai 400 050. Dilip Kumar has worked in total 62 films ranging from Jwar Bhata (1944) to Qila (1998) and in the vicinity has won almost 8 Filmfare Awards including a super hatrick in the films Daag (1954), Azaad (1956), Devdas (1957) and Naya Daur (1958).. In addition he has also won the filmfare lifetime achievement award in the year 1994. In addition he has also won the Filmfare Awards for Kohinoor (1961), Leader (1964), Ram aur Shyam (1967) and Shakti (1982). In fact Dilip Kumar still holds the record of winning the most Filmfare Awards (Total 8 Awards) in the category for Best Actor till the current year 2009, the second runner up being Shah Rukh Khan with 7 filmfare awards. Such was the greatness of these personalities. Please keep the good show Mr Bijoorjee. bijoor sahab hats off to you. sometime back you had contacted me and i never realized at that time that you were working out an article like this one. you are a silent but a dedicated worker and there are several aces under your sleeve. you have described perfectly the chemistry of the foursome -shakeel-naushad-dilipkumar-rafisahab- which will remain the greatest ever combination to have hit hindi film world. nothing else can replace that at the altar. 99.99% of songs of dilip kumar having been rendered by rafi sahab is a very bold statement because before the advent of rafi sahab, talat mahmood was considered the voice for dilip kumar and mukesh too has rendered some songs on the veteran actor. nevertheless, rafi sahab had designed a specific modulation for dilip kumar and anyone could tell that the song is picturised on dilip kumar just by listening to the song. rafi sahab had that unique ability to transform into the character for whom the songs are being rendered, but fitted dilip kumar’s character to the hilt. great article anyway. keep it up bijoor sahab, we expect more and more topics from you.